The history of liver surgery stretches back to ancient times, when battle surgeons introduced debridement of damaged liver segments from open wounds. However, formal entry into the abdominal cavity to treat a liver tumor or to drain an abscess began with the advent of general anesthesia and antisepsis in the late 1800s. With a better understanding of hepatic anatomy and the segmental structure of the liver, surgeons started performing partial liver resections. The first successful resection of a liver tumor was performed in 1887 in Germany by Langenbuch, the same surgeon who performed the first successful cholecystectomy 5 years earlier. As experience with liver resections increased dramatically while the supply of cadaveric liver grafts became increasingly inadequate to meet the needs for liver transplants, the concept of resecting a healthy person’s liver to use for support of another person’s life was raised. To be considered eligible for LDLT, a patient should be able to fulfill the minimal listing criteria for deceased donor (DD) transplantation. All potential LDLT recipients must first be listed on the regular liver transplant waiting list with the United Network for Organ Sharing (UNOS). Any contraindication for DD transplant applies to living donor recipients, which is why, in all centers, the evaluation of a potential donor does not start until the recipient is listed. However, in the adult population, such issues play an important role in determining eligibility for LDLT. Because living donation involves a healthy individual placed at surgical risk for the benefit of a transplant recipient, the general concept is that LDLT should be performed in recipients who would not receive a DD transplant as soon as they need it, based on the severity of their illness. In other words, the shortage of DD organs is the paramount principle of living donation. However, for this to be ethically justified, the anticipated survival of the recipient should be sufficient to support such an act. Two groups of recipients are considered ideal candidates for LDLT. The selection of the donor has ethical and medical considerations. Autonomy for the donor involves the respect for his or her right to act intentionally and without coercion. The donor has the right to choose what may be a high-risk donation, provided that consent is fully informed. The principle of informed consent goes beyond explanation of the surgical procedure. All the information about the risks and benefits of the living donation, as well as all national and center data, should be included in the consent discussion. The principles of beneficence (doing good) and nonmaleficence (not inflicting harm) are, at times, in competition in the cases of living organ donations, since healthy individuals are undergoing a potentially harmful procedure to help someone else. Donor advocacy panels are an integral part of all centers that perform LDLT. Their main task is to ensure that all the above principles are strongly present and are followed in the evaluation of every donor. Medical considerations of the living donor are that (1) the donor must be in excellent health in order to be able to undergo the operation and the postoperative and recovery period with minimal physical and psychological distress and that (2) the liver of the donor is of such quality and size that it can be divided in a way that can support both the donor and recipient. These are two separate issues for which testing criteria often overlap but that are at times in conflict. In such cases, donor safety is the priority. The potential donor liver is evaluated thoroughly with laboratory and radiology tests. Liver function test results should be perfect in order to proceed to the radiologic evaluation of the liver. High-resolution CT scanning with angiography and cholangiography or MRI are the most common modalities used in most centers. The examination of liver quality is very important. Relevant steatosis must be excluded, as it lowers the functional liver mass. Any other parenchymal abnormalities (eg, iron deposits, tumors) should also be ruled out. Finally, a comprehensive vascular and biliary roadmap facilitates detailed surgical planning and reduces postoperative complications in both donor and recipient. All the potential anatomical variations should be clearly demonstrated and identified, as this will provide the surgeon with the ability to plan the surgical technique and to identify grafts that would be inappropriate because of anatomical variations. Foster JH. History of liver surgery. Arch Surg. 1991. 126:381-7. C. C. Le Foie. Etudes Anatomiques et Chirurgicales. Paris: Masson; 1957. STARZL TE, MARCHIORO TL, VONKAULLA KN, HERMANN G, BRITTAIN RS, WADDELL WR. HOMOTRANSPLANTATION OF THE LIVER IN HUMANS. Surg Gynecol Obstet. 1963. 117:659-76. Zitelli BJ, Gartner JC, Malatack JJ, et al. Pediatric liver transplantation: patient evaluation and selection, infectious complications, and life-style after transplantation. Transplant Proc. 1987. 19:3309-16. Broelsch CE, Emond JC, Thistlethwaite JR, Rouch DA, Whitington PF, Lichtor JL. Liver transplantation with reduced-size donor organs. Transplantation. 1988. 45:519-24. Raia S, Nery JR, Mies S. Liver transplantation from live donors. Lancet. 1989. 2:497. Strong RW, Lynch SV, Ong TH, Matsunami H, Koido Y, Balderson GA. Successful liver transplantation from a living donor to her son. N Engl J Med. 1990. 322:1505-7. Curran C. Adult-to-adult living donor liver transplantation: history, current practice, and implications for the future. Prog Transplant. 2005. 15:36-42, quiz 3-4. Singer PA, Siegler M, Whitington PF, Lantos JD, Emond JC, Thistlethwaite JR, et al. Ethics of liver transplantation with living donors. N Engl J Med. 1989 Aug 31. 321(9):620-2. [Medline]. Broelsch CE, Whitington PF, Emond JC, Heffron TG, Thistlethwaite JR, Stevens L, et al. Liver transplantation in children from living related donors. Surgical techniques and results. Ann Surg. 1991 Oct. 214(4):428-37; discussion 437-9. [Medline]. [Full Text]. Kawasaki S, Hashikura Y, Ikegami T, Nakazawa Y, Miwa S, Kubota T, et al. First case of cadaveric liver transplantation in Japan. J Hepatobiliary Pancreat Surg. 1999. 6(4):387-90. [Medline]. Hashikura Y, Makuuchi M, Kawasaki S, Matsunami H, Ikegami T, Nakazawa Y, et al. Successful living-related partial liver transplantation to an adult patient. Lancet. 1994 May 14. 343(8907):1233-4. [Medline]. Ben-Haim M, Emre S, Fishbein TM, Sheiner PA, Bodian CA, Kim-Schluger L, et al. Critical graft size in adult-to-adult living donor liver transplantation: impact of the recipient's disease. Liver Transpl. 2001 Nov. 7(11):948-53. [Medline]. Tucker ON, Heaton N. The 'small for size' liver syndrome. Curr Opin Crit Care. 2005 Apr. 11(2):150-5. [Medline]. Emond JC, Renz JF, Ferrell LD, Rosenthal P, Lim RC, Roberts JP, et al. Functional analysis of grafts from living donors. Implications for the treatment of older recipients. Ann Surg. 1996 Oct. 224(4):544-52; discussion 552-4. [Medline]. [Full Text]. Organ Procurement and Transplantation Network. Available at https://optn.transplant.hrsa.gov/data/view-data-reports/. Accessed: October 16, 2018. Brown RS Jr, Russo MW, Lai M, Shiffman ML, Richardson MC, Everhart JE. A survey of liver transplantation from living adult donors in the United States. N Engl J Med. 2003 Feb 27. 348(9):818-25. [Medline]. Brown RS. Live donors in liver transplantation. Gastroenterology. 2008. 134:1802-13. American Society of Transplant Surgeons. Position paper on adult-to-adult living donor liver transplantation. Liver Transpl. 2000. 6:815-7. Cotler SJ, Cotler S, Gambera M, Benedetti E, Jensen DM, Testa G. Adult living donor liver transplantation: perspectives from 100 liver transplant surgeons. Liver Transpl. 2003 Jun. 9(6):637-44. [Medline]. Berg CL, Gillespie BW, Merion RM, Brown RS Jr, Abecassis MM, Trotter JF, et al. Improvement in survival associated with adult-to-adult living donor liver transplantation. Gastroenterology. 2007 Dec. 133(6):1806-13. [Medline]. [Full Text]. Olthoff KM, Smith AR, Abecassis M, Baker T, Emond JC, Berg CL, et al. Defining long-term outcomes with living donor liver transplantation in North America. Ann Surg. 2015 Sep. 262 (3):465-75; discussion 473-5. [Medline]. [Full Text]. Tan HP, Patel-Tom K, Marcos A. Adult living donor liver transplantation: who is the ideal donor and recipient?. J Hepatol. 2005 Jul. 43(1):13-7. [Medline]. Szymczak M, Kaliciński P, Kowalewski G, Broniszczak D, Markiewicz-Kijewska M, Ismail H, et al. Acute liver failure in children-Is living donor liver transplantation justified?. PLoS One. 2018. 13 (2):e0193327. [Medline]. [Full Text]. Malagó M, Testa G, Marcos A, et al. Ethical considerations and rationale of adult-to-adult living donor liver transplantation. Liver Transpl. 2001. 7:921-7. Olthoff KM, Merion RM, Ghobrial RM, Abecassis MM, Fair JH, Fisher RA. Outcomes of 385 adult-to-adult living donor liver transplant recipients: a report from the A2ALL Consortium. Ann Surg. 2005 Sep. 242(3):314-23, discussion 323-5. [Medline]. Wiesner R, Edwards E, Freeman R, Harper A, Kim R, Kamath P, et al. Model for end-stage liver disease (MELD) and allocation of donor livers. Gastroenterology. 2003 Jan. 124(1):91-6. [Medline]. Testa G, Malagó M, Nadalin S, et al. Right-liver living donor transplantation for decompensated end-stage liver disease. Liver Transpl. 2002. 8:340-6. NYSH. New York State Committee on quality improvement in living liver donation. 2002. Marcos A, Ham JM, Fisher RA, Olzinski AT, Posner MP. Surgical management of anatomical variations of the right lobe in living donor liver transplantation. Ann Surg. 2000 Jun. 231(6):824-31. [Medline]. [Full Text]. Gondolesi GE, Varotti G, Florman SS, Muñoz L, Fishbein TM, Emre SH, et al. Biliary complications in 96 consecutive right lobe living donor transplant recipients. Transplantation. 2004 Jun 27. 77(12):1842-8. [Medline]. Lee HW, Suh KS. Expansion of the criteria for living donor liver transplantation for hepatocellular carcinoma. Curr Opin Organ Transplant. 2016 Apr. 21 (2):231-7. [Medline]. Todo S, Furukawa H. Living donor liver transplantation for adult patients with hepatocellular carcinoma: experience in Japan. Ann Surg. 2004. 240:451-9; discussion 9-61. Trotter JF. Living donor liver transplantation: is the hype over?. J Hepatol. 2005. 42:20-5. Macklin R. Bioethics, vulnerability, and protection. Bioethics. 2003. 17:472-86. Marcos A. Right-lobe living donor liver transplantation. Liver Transpl. 2000. 6:S59-63. Tan HP, Markowitz JS, Maley WR, Merritt WT, Klein AS. Successful liver transplantation in a patient with Budd-Chiari syndrome caused by homozygous factor V Leiden. Liver Transpl. 2000 Sep. 6(5):654-6. [Medline]. Low G, Wiebe E, Walji AH, Bigam DL. Imaging evaluation of potential donors in living-donor liver transplantation. Clin Radiol. 2008 Feb. 63(2):136-45. [Medline]. Olsen SK, Brown RS Jr. Live donor liver transplantation: current status. Curr Gastroenterol Rep. 2008 Feb. 10(1):36-42. [Medline]. Fan ST. Donor safety in living donor liver transplantation. Liver Transpl. 2000. 6:250-1. Ben-Haim M, Carmiel M, Lubezky N, Keidar R, Katz P, Blachar A, et al. Donor recruitment and selection for adult-to-adult living donor liver transplantation in urgent and elective circumstances. Isr Med Assoc J. 2005 Mar. 7(3):169-73. [Medline]. Etesami K, Genyk Y. The increasingly limited basis for graft inflow modulation in living donor liver transplantation. Liver Transpl. 2018 Sep 27. [Medline]. Gruttadauria S, Pagano D, Luca A, Gridelli B. Small-for-size syndrome in adult-to-adult living-related liver transplantation. World J Gastroenterol. 2010 Oct 28. 16(40):5011-5. [Medline]. [Full Text]. Sato Y, Kobayashi T, Nakatsuka H, Yamamoto S, Oya H, Watanabe T, et al. Splenic arterial ligation prevents liver injury after a major hepatectomy by a reduction of surplus portal hypertension in hepatocellular carcinoma patients with cirrhosis. Hepatogastroenterology. 2001 May-Jun. 48(39):831-5. [Medline]. Marcos A, Olzinski AT, Ham JM, Fisher RA, Posner MP. The interrelationship between portal and arterial blood flow after adult to adult living donor liver transplantation. Transplantation. 2000 Dec 27. 70(12):1697-703. [Medline]. Luca A, Miraglia R, Caruso S, Milazzo M, Gidelli B, Bosch J. Effects of splenic artery occlusion on portal pressure in patients with cirrhosis and portal hypertension. Liver Transpl. 2006 Aug. 12(8):1237-43. [Medline]. Bassignani MJ, Fulcher AS, Szucs RA, Chong WK, Prasad UR, Marcos A. Use of imaging for living donor liver transplantation. Radiographics. 2001 Jan-Feb. 21(1):39-52. [Medline]. Miyagi S, Kakizaki Y, Shimizu K, Miyazawa K, Nakanishi W, Hara Y, et al. Arterial and biliary complications after living donor liver transplantation: a single-center retrospective study and literature review. Surg Today. 2018 Feb. 48 (2):131-139. [Medline]. Incision for living donor hepatectomy. The left lateral subcostal extension can be avoided depending on the donor body habitus. The left branch of the portal vein and the left hepatic artery have been dissected free from surrounding tissue. Notice that in this donor there are two separate arteries supplying the segment II and III. After the parenchmymal dissection reaches the hilar plate, a right angle clamp is passed behind the bile duct. The bile duct is divided with a knife for precise transection and preservation of its vascular supply. Brisk bleeding after the division of bile duct. The parenchyma and the bile duct have been divided. The cholangiogram catheter has been inserted in the cystic duct stump for the performance of the cholangiogram. Intraoperative cholangiogram reveals normal bile duct anatomy. A right angle clamp inserted in the groove between the left and middle hepatic veins. After clamping the left hepatic artery and the left portal vein the left lobe of the liver becomes dusky and the demarcation line is visible. The line of parenchymal dissection has been marked with the cautery on the anterior/cephalad surface of the liver. The line of dissection as it is marked at the posterior surface of the liver. Segment V vein draining in the middle hepatic vein is double ligated. The stump of the left and middle hepatic vein is clamped with a German clamp. The left lobe graft in the preservation solution basin. The remaining right lobe inspected for signs of bleeding or bile leak. Intraoperative cholangiogram. The bulldog clamp has been placed to facilitate the evaluation of the division point. Large middle right accessory vein. After clamping of the right hepatic artery and right portal vein, the right lobe becomes dusky and the demarcation line is visible. The middle hepatic vein is preserved with the remaining left lobe in the donor. The liver parenchyma and the bile duct have been transected. 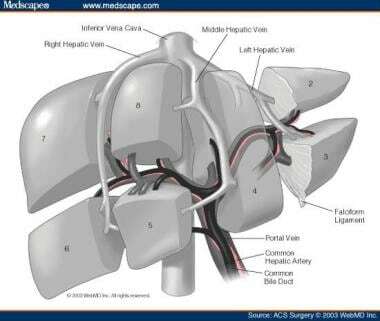 The right hepatic artery and right portal vein have been dissected up to the bifurcation of the main hepatic artery and portal vein.